Update: We have temporarily disabled LFG listings until we can get a proper fix in for this. There is a work around that can midigate some of the issue though it is not a proper fix but can help get people back into WvW sooner than we can have a patch ready. 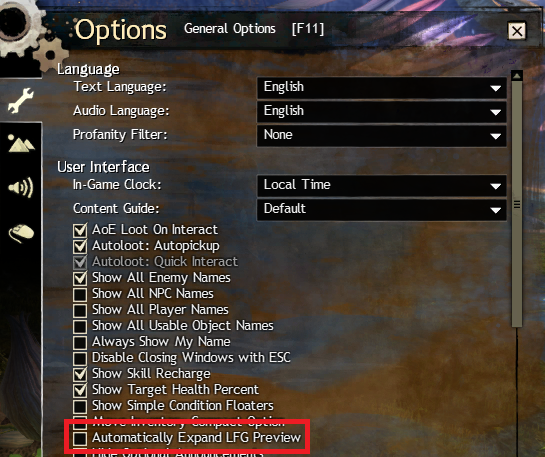 Unchecking the "Automatically Expand LFG Preview" will allow you to enter WvW without crashing. The LFG preview UI can still cause a crash so be careful using it while in WvW. No. I do wut I wunt. So pve players can't access the lfg either now? Not like anyone ever uses LFG in WvW anyway. I was thinking the same thing.... who the hell uses LFG in WvW? And, Raymond, thanks for the work-around! Good to know! Yes, indeed. Since this is available, I've never seen or used it before. Groups are organized via TS, community guilds or team chat. The system was inserted much too late. The LFG killed the essence of guilds in PvE too much like the merging of PvE into megaserver that killed server pride. based on my observations, poeple on pve now starts to lfg via "chat", map team etc, whats the best way to get a group is via guild chat, guilds and friends will be a thing now without the lfg atleast for a short time till they found a fix. I actually do use LFG in WvW, and several other commanders I know use it too. You don't realise that LFG is like 100500 times more important than WvW? not helpful ... work arounds? The workaround prevents the crash, not that it allows you to use LFG. I think this is a great opportunity re-evaluate this system entirely, and I have a solid start on an idea to do so. Show commander name and tag color for all open-join squads on the map. This will show incoming players what (open) squads are operating right off the bat. Double / right click to join. This would also facilitate earning higher pips for new commanders. Don't want people joining your squad? No problem, just make it private / invite only. 2) After players select an option above, their name is placed into LFG under that specific category. Now, incoming players can connect with these people. The result is an LFG panel with more parties, squads, and players connecting with one another, made possible by making the process simpler and more intuitive, with very little effort. I'll assume he meant "mitigate"
Nobody cares about some dead gamemode. Disable WvW, not the LFG. Great idea, also for raid lfg they really should categorise it for classes too to filter out people entering with the wrong class type. That also solves too many of 1 thing entering and closing the squad, e.g you ask for 1 healer 1 tank, 2 healers see the lfg and join same time closing the group. 1 of them has to leave and the lfg may get suppressed for 'excess use'. LFG came very late in the game and it's not a very good tool either, the game fails on some very basic things we take for granted in other mmos. It wouldn't be dead if Anet focused on it rather than pvp, WvW was special 5yrs ago but it's largely stagnant since so no wonder people lost interest playing the same thing week after week. This is a bit off topic, but yeah, I agree - WvW has much more potential than sPvP and definitely deserves way more resources. Unfortunately, as it currently is, disabling WvW would have upset significantly fewer people than disabling LFG. Yep, I remember how silly it was finding parties before we had a proper LFG, people would even go on a website to look for parties or flood map chat. At least back then the game worked very well with an open browser for older machines vs after they change the trading post hosts. 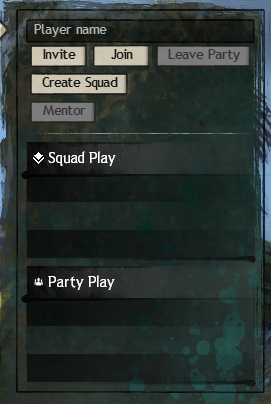 Because the first thing I do when I enter WvW is open up the LFG window to find those small 5-man havoc parties which around doing their own thing. No wait, we just follow the tag/zerg. You necro'd a year dead thread not related to anything now why?